BACKGROUND AND PURPOSE: In order to clarify the incidence and evolution of disk displacement in the temporomandibular joint (TMJ) in children, we performed a longitudinal analysis in 18 subjects. Some investigators have suggested that sonography can provide information about the articular disk position of the TMJ. The purpose of this study was to determine the diagnostic accuracy of sonography for revealing internal derangement of the TMJ in elementary school children compared with our standard of reference, MR imaging and helical CT.
METHODS: Eighteen children were examined using both sonography and MR imaging or helical CT or both. The sonographically revealed distance between the articular capsule and the lateral surface of the mandibular condyle was measured and compared with that obtained by MR or helical CT scanning. RESULTS: Compared with our MR/CT standard of reference, sonography revealed a sensitivity of 83%, a specificity of 96%, and an accuracy of 92% for identifying disk displacement (defined as a distance of 4 mm or more between the articular capsule and the lateral surface of the mandibular condyle). CONCLUSION: Although sonography's sensitivity, specificity, and accuracy for the diagnosis of disk displacement were slightly inferior to those of MR or helical CT, we assert it is a useful imaging method for longitudinal investigations of a large group of elementary school children. Internal derangement of the TMJ should be suspected if sonography reveals a distance between the articular capsule and the lateral surface of the mandibular condyle of 4 mm or more. Internal derangement is one of the most common intraarticular abnormalities of the temporomandibular joint (TMJ) (1), defined as an abnormal positional and functional relationship between the articular disk and the mandibular condyle and the articular surfaces of the temporal bone (2). It is most often an anterior displacement of the disk relative to the mandibular condyle (2). MR imaging is a common diagnostic method for the evaluation of articular disk displacement (1). Helical CT can also detect the displaced disk. Recent investigators (3) who have compared helical CT and MR imaging assert that the visibility of anterior disk displacement on axial helical CT scans is equal to that of MR images. Although the majority of patients with TMJ symptoms have internal derangement of the TMJ (4), it has been suggested that disk displacement is not always associated with TMJ symptoms (5, 6). Disk displacement is relatively common in asymptomatic subjects who do not have joint sounds, articular pain, or limited jaw opening (5). The prevalence of asymptomatic disk displacement on MR images has been reported to be 34% in a population ranging in age from 6 to 25 years (5) and 31% in adults (6). Because of a high prevalence of disk displacement found in asymptomatic TMJs, it has been suggested that the condition represents a congenital normal anatomic variant (7). On the contrary, Paesani and coworkers (8) obtained MR images from 30 infants and young children ranging in age from 2 months to 5 years and observed that none of the subjects had disk displacement, suggesting that disk displacement in the TMJ might be an acquired condition. In order to clarify the incidence and evolution of disk displacement in children, longitudinal analyses including a sufficiently large group of subjects, especially of elementary school children, are needed. Sonography is an ideal method for this purpose, because it is noninvasive and less expensive to perform than are any other imaging techniques used to detect internal derangement of the TMJ. Recent studies (9–12) have suggested that sonography can provide information about the disk displacement of the TMJ. We sought to evaluate the accuracy of sonography for the diagnosis of disk displacement of the TMJ in elementary school children, comparing sonographic findings with those of our standard of reference, MR and helical CT.
From October 1996 through March 2000, 18 children without subjective TMJ symptoms were enrolled consecutively in this study. They were examined with sonography followed by MR and/or helical CT examinations within 2 months after sonography. The patient cohort consisted of 11 female and 7 male Japanese children who ranged in age from 8 years to 12 years. Four children were examined with MR imaging, 12 with helical CT, and two with both MR and helical CT examination. Neither informed consent nor approval by an institutional review board was sought or obtained. Helical CT examinations were performed to evaluate the morphology of the bony structures of the TMJ in detail, because the possible bony changes of the mandibular condyle were suspected on panoramic radiography taken for the planning of orthodontic treatment. Sonography was performed with a high-resolution real-time scanner equipped with a 10-MHz mechanical sector transducer or an 8-MHz linear transducer. All patients were examined by one of the authors (T.H.) who had no information regarding MR or helical CT findings. The transducer was positioned against the skin surface of the TMJ in a transverse direction running parallel to the Camper line (the line intersecting the ala of the nose and the tragus of the ear), which was familiar to the dentists as an indicator of the occlusal plane (13) (Fig 1). The transducer was placed to abut the tragus of the ear and was gradually shifted to obtain optimal visualization of the lateral pole of the mandibular condyle, which was clearly seen to be nearest to the skin surface while the patient was in either the closed- or open-mouth position. 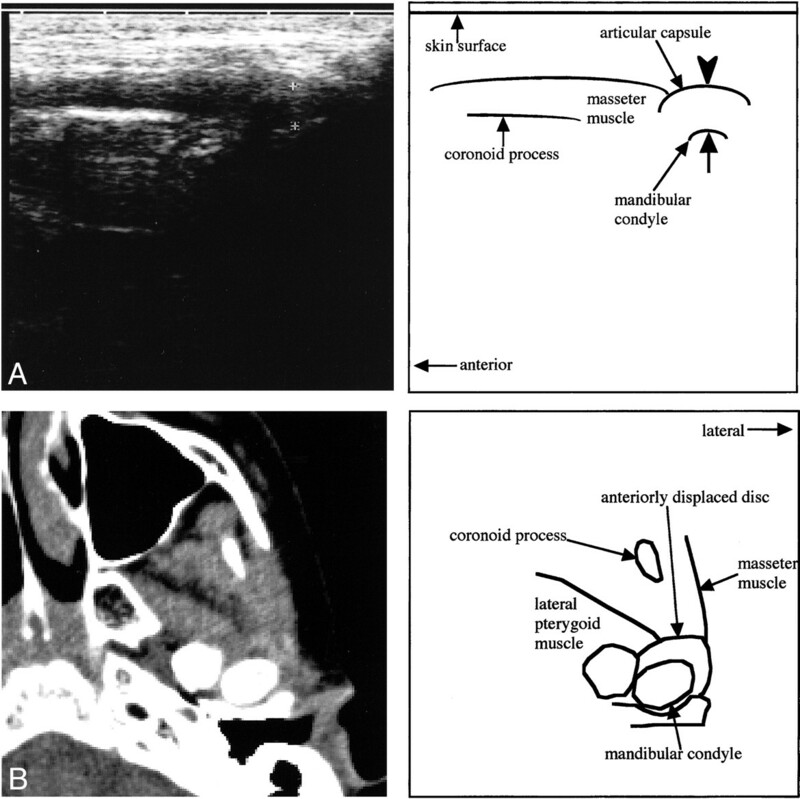 A distance between the articular capsule (a hyperechoic line running parallel to the surface of the mandibular condyle) and the lateral surface of the mandibular condyle was measured on the display of the sonographic equipment while the subject was in the closed-mouth position (Fig 2). Measurements were rounded off to the nearest mm. Helical scans were taken parallel to the anthropologic baseline starting at the level a few mm above the baseline over a distance of 5 cm at 120kV, 100mA, with 1-mm collimation, and the scanning table was advanced with increments of 1 mm/rotation. The children were placed in a supine, closed-mouth position. Scanning data were reformatted into 1-mm-interval axial images. All images were evaluated with soft-tissue display (window width, 240; window level, 40). On axial CT scans, disk displacement was defined as an area of soft-tissue density of semilunar shape that was 0.5 mm or more in anteroposterior diameter, located in front of the mandibular condyle, and visibly contiguous on more than two images (3). If the soft-tissue density was not seen anterior to the mandibular condyle, the disk was presumed to be in a normal superior position. MR imaging was performed on a 1.0-T or a 1.5-T imager with two TMJ surface coils or a head coil. T1-weighted transverse axial spin-echo (520/14/2 [TR/TE/excitations]) and proton density–weighted (2500/16–20/2) images with a 150-mm × 150-mm field of view, a 3-mm slice thickness, and no interslice gap were obtained. Oblique parasagittal slices were obtained perpendicular to the line that indicated the long axis of the mandibular condyle on an axial slice. MR imaging was performed while the patient was in a supine, closed-mouth position. The position of the articular disk was defined according to the previously reported definition (14). A normal superior position was defined as having the posterior band of the disk located superior to the apex of the mandibular condyle. Disk displacement was defined as having the posterior band of the disk located anterior to the mandibular condyle either partially or totally. None of the children manifested lateral or medial displacement. Two of the authors (T.H., J-i.K.) determined the presence or absence of disk displacement on MR and helical CT scans by consensus. Of 36 joints of 18 children, we could not definitely identify the articular disk in all joints on sonograms in both closed- and open-mouth positions. On the other hand, a distance between the articular capsule and the lateral surface of the mandibular condyle varied from 2 mm to 7 mm (Fig 2). On sonograms, a distance between the articular capsule and the lateral surface of the mandibular condyle was 2 mm in 13 joints, 3 mm in 12 joints, 4 mm in seven joints, 5 mm in two joints, 6 mm in one joint, and 7 mm in one joint (Tables 1 and 2). On MR or helical CT scans, disk displacement of the TMJ was observed in 12 joints of eight children (Tables 1 and 2). MR and/or helical CT examination revealed disk displacement in 10 of 11 joints, with a distance between the articular capsule and the lateral surface of the mandibular condyle of 4 mm or more and in two of 25 joints with a distance less than 4 mm. There were 10 true-positive (Figs 3A [sonography] and B [MR], 4 [MR], and 5A [sonography] and B [CT]), 23 true-negative (Figs 3C [sonography] and D [MR] and 4 [MR]), one false-positive, and two false-negative findings. Sonography's sensitivity, specificity, and accuracy for the diagnosis of disk displacement, relative to MR and/or CT as the standard of reference, were 83%, 96%, and 92%, respectively. A, A transverse section of sonography of the right TMJ obtained while the patient was in the closed-mouth position. Note a hyperechoic line (arrowhead) running lateral and parallel to the lateral surface (arrow) of the mandibular condyle, indicating the articular capsule. The distance between the articular capsule and the lateral surface of the mandibular condyle is 4 mm. B, A sagittal proton density–weighted image of the right TMJ obtained while the patient was in the closed-mouth position. Note the posterior band of the articular disk located anterior to the mandibular condyle (anterior disk displacement). The evaluation of the disk displacement on A is a true-positive result. C, A transverse section of sonography of the left TMJ obtained while the patient was in the closed-mouth position. The distance between the articular capsule (arrowhead) and the lateral surface (arrow) of the mandibular condyle is 3 mm. 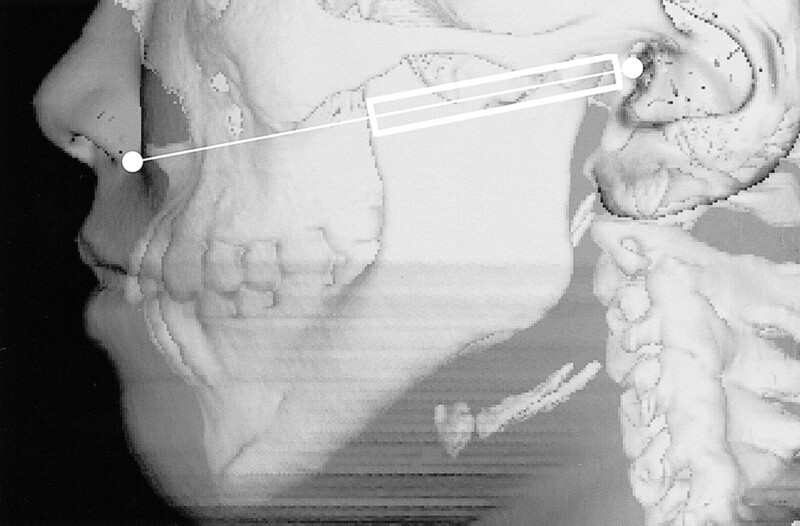 D, A sagittal proton density–weighted image of the left TMJ obtained while the patient was in the closed-mouth position. Note the posterior band of the articular disk located superior to the mandibular condyle (normal superior position). The evaluation of the disk displacement on C is a true-negative result. A, A transverse sonographic section of the left TMJ obtained while the patient was in the closed-mouth position. The distance between the articular capsule (arrowhead) and the lateral surface (arrow) of the mandibular condyle is 5 mm. B, A transverse CT section at the level of the mandibular condyle obtained while the patient was in a closed-mouth position. Note the hyperdense area in front of the left mandibular condyle indicating the anteriorly dislocated articular disk. Disk displacement on A is a true-positive result. Tasaki and Westesson (15) reported that the sensitivity, specificity, and accuracy of MR imaging for revealing disk position of the TMJ in 55 fresh cadavers were 90%, 100%, and 95%, respectively. Image quality of recent MR has markedly improved since Tasaki and Westesson's study (15), and sensitivity now clinically approaches 100%. Our recent investigation (3) directly comparing helical CT and MR imaging revealed the visibility of an anterior displaced disk to be almost equal on CT scans to that on MR images. We have found the sensitivity, specificity, and accuracy of helical CT for revealing articular disk position to be 91%, 100%, and 97%, respectively, when the image was obtained from the patient in the closed-mouth position and 96%, 99%, and 98%, respectively, when the patient was in the open-mouth position. According to Brooks et al (16), sonography is not sensitive or specific for any TMJ abnormality. However, recent studies have suggested that sonography can provide some information regarding the articular disk position of the TMJ. Nabeih and Speculand (9) evaluated 25 patients with TMJ dysfunction by both sonography and arthrotomography. They examined the subjects in the coronal plane with a 3.5-MHz transducer and suggested that anterior disk displacement seemed to be displayed as a mandibular condyle located more deeply within the glenoid fossa. However, they did not mention the diagnostic accuracy of sonography. Stefanoff and coworkers (10) evaluated the disk position of the TMJ in 23 asymptomatic volunteers (12 women and 11 men; age range, between the ages of 30 and 40 years) with a 5-MHz transducer and described an incidence of 2.1% for disk displacement. Emshoff and colleagues (11) evaluated 17 patients (14 women and three men, between the ages of 16 and 60 years) with TMJ dysfunction by use of a 7.5-MHz transducer. They described a sensitivity of 41% and a specificity of 70% with static sonography and a sensitivity of 31% and a specificity of 95% with dynamic sonography by comparing findings with those of MR imaging, the standard of reference. None of these above-mentioned articles gave definite sonographic diagnostic criteria on disk displacement. Judging from the images they showed, it is likely that they considered a hyperechoic line running lateral and parallel to the surface of the mandibular condyle to be an articular disk. In our previous study (12) of 60 patients with TMJ dysfunction (47 female and 13 male, between the ages of 13 and 72 years) examined with a 10- MHz transducer, we observed that the distance between the articular capsule and the lateral surface of the mandibular condyle varied from 2 mm to7 mm. MR imaging was also performed in 32 patients in order to evaluate disk diplacement. By comparing sonographic findings with those of MR imaging, we reported sonography's sensitivity, specificity, and accuracy for the diagnosis of disk displacement was 63%, 100% and 72%, respectively, if the rule that a distance of 3 mm or more indicates the internal derangement was applied. In our present study, the most accurate criterion of the distance was 4 mm in elementary school children. The cause of discrepancy between the criterion in the previous study and that in the present study was unclear. We considered the hyperechoic line running lateral and parallel to the lateral surface of the mandibular condyle to be the articular capsule rather than the articular disk, because the articular disk in a normal superior position might not be visible on sonograms obtained through the skin surface of the TMJ. The scanning plane we selected was a transverse section and only the lateral aspect of the TMJ at the level of the articular tubercle could be displayed. In the present study, the distance between the articular capsule and the lateral surface of the mandibular condyle was significantly greater in joints with a displaced disk than in joints without disk displacement. We theorize that a widened distance between the articular capsule and mandibular condyle identified by use of sonography might mainly result from the interposition of a displaced disk between them. The distance between the articular capsule and the lateral surface of the mandibular condyle might exceed 4 mm only if the articular disk is displaced anterolaterally. An anteromedially displaced disk might cause narrowing of this distance and therefore a false-negative result. The main disadvantage of sonography is that it does not indicate the position of the articular disk clearly. Because the internal echoes of the articular disk are apparently similar to those of the articular capsule, it is difficult to distinguish the articular disk from the articular capsule on sonograms. 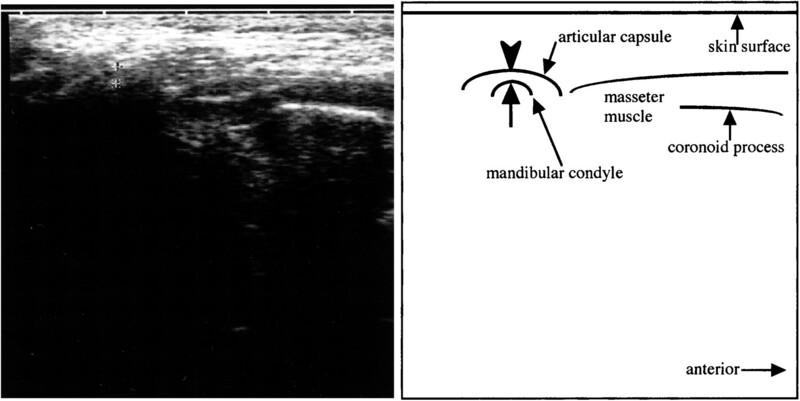 Sonography was performed by a single observer; little intraobserver variability in measuring the distance between the articular capsule and the lateral surface of the mandibular condyle was seen. However, further studies are needed to establish the reproducibility of this examination. Internal derangement of the TMJ may occur during the early stage of the period of elementary school in consideration of a marked difference observed in the incidence between the two reports (5, 8). One indicated the incidence of 0% in a population aged 5 years or younger (8), and the other of 34% in a population aged 6 years or older (5). MR imaging in our present study showed that 12 (33%) of 36 joints had internal derangement in asymptomatic children, which is almost equal to the above-reported incidence among children 6 years or older (5). Internal derangements may cause a facial asymmetry in young persons (17). To clarify a cause-and-effect relationship between internal derangement and jaw deformity, longitudinal studies on the same individuals during a growth period, especially ones without clinical TMJ symptoms, are needed. However, it is not practical to examine every child with MR imaging or helical CT because of clinical availability, the high cost of MR imaging, and the problematic ionizing radiation of CT. Although sonography's sensitivity, specificity, and accuracy for the diagnosis of disk displacement were slightly inferior to those of MR or helical CT, we considered that sonography was a useful imaging method for longitudinal investigations, including a large group of elementary school children. Sonography was less sensitive or specific than was MR imaging or helical CT in detecting internal derangement in the TMJ. However, internal derangement of the TMJ should be suspected if a distance between the articular capsule and the lateral surface of the mandibular condyle on sonograms is 4 mm or more. ↵1 Address reprint requests to Takafumi Hayashi, DDS, PhD, Department of Oral and Maxillofacial Radiology, Faculty of Dentistry, Niigata University, 2-5274, Gakkocho-dori, Niigata 951-8514. Is high-resolution ultrasonography suitable for the detection of temporomandibular joint involvement in children with juvenile idiopathic arthritis?